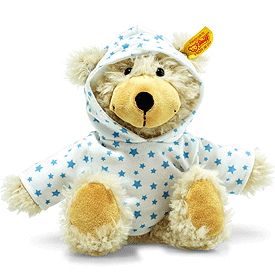 Steiff Charly Stars Dangling Teddy with Hoody is made by hand, in the finest beige cuddly soft plush. Charly Stars dangling Teddy bear with hoody is 23 cm tall and is ready for any adventure. The hood has openings so that the Teddy bear's ears can poke through. His beige coat is curly and his silly black nose sits right in the middle of a cheerful caramel-coloured face. Sitting is no problem for this cute little guy thanks to the sewn-in bean bags. The hoody can be removed. The cream-coloured hoody has blue stars printed all over it. You can also buy Charly without a hoody.